Lightning in a Bottle is not your ordinary festival! This is the most fun you will ever have in your life! At Lightning in a Bottle, the sky is truly the limit when it comes to what you can learn and experience! They continue their decade-spanning dedication to musical and mental diversity with a lineup that boasts big names and killer grooves across styles and tempos. Headlining is the new school’s ultimate funk master Anderson Paak & The Free Nationals. Other performances include: ZHU, Griz,Fever Ray, The Glitch Mob, Modeselektor, Tipper, Emancipator, Nicole Moudaber, The Black Madonna, MK, Yotto, Sofi Tukker, Tune-Yards, Nao, Beats Antique, Tokimonsta, Giraffage and more! In addition to the incredible music lineup, the festival has announced live painting lineup, art classes, learning kitchen lineup, content partners, and yoga & movement lineup. 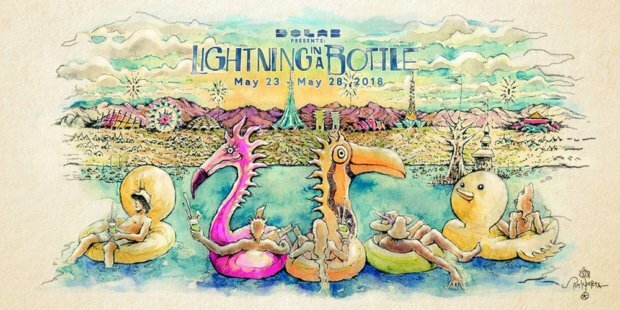 Lightning in a Bottle 2018 comes to Lake San Antonio in Bradley, CA., for six days Wednesday to Monday, May 23 to 28. Visit LiB online for tickets and more information, and check out the official 2018 Video below!